The farm is producing rainbow and golden trout in cold water, flow-through raceways which feed a deep water raft culture hydroponic greenhouse and a phytoremedation plant production pond. These features make the project here unlike any other one known in the world. Most aquaponic production consists of circulating systems where the water is reused many times over and depending on climate, generally produces warm water fish species. 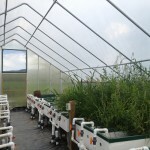 The cold water flow-through systems are interesting because the researchers here are testing conditions in which phytoremediation plants can be cultivated so that they remove close to all nutrients in the effluent water which has proven to be an important, natural way to remove pollutants from water bodies. Reclaimed mine water is also being used in one of the systems which has a very high mineral content and provides a productive system where outflow water from the mine water treatment plants can be used for production before it enters the watershed, allowing the abundance of minerals to be used for fish culture. One of the most important aspects of the work done in aquaculture and aquaponics is studying and caring for the fish. 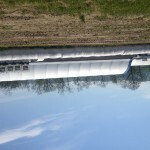 Fish are frequently transported to and from Morgantown (where WVU is actually located), the USDA Agricultural Research Service National Cool and Cold Water Aquaculture center and the Wardensville farm. The USDA ARS performs genetic and disease resistance research on the fish and, after their use, must “get rid” of them somehow. By transporting them in the “fish hauler”, the associates from WVU and the extension service are granted a free fish source for their aquaculture and aquaponics projects and the fish usually end up getting donated to community members at the end of their life cycles. The USDA ARS primarily deals with trout species but I have spent many hours this past week hauling fish of many different species: trout, perch, carp, catfish and even sturgeon. I received a tour of the USDA ARS which was very interesting. The facility has millions of dollars worth of equipment and extensive research goes on there. 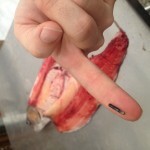 In one of the pictures, you can see the identification implants that are put into the fish at the USDA ARS which must be taken out when the fish are being fileted to be donated. To test my knowledge of operating an aquponics system, my supervisor charged me with the task of managing the small, backyard-sized system that is located in the greenhouse. I feed the fish everyday, check the water quality levels and add supplemental inputs to balance the pH. 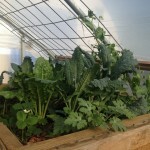 It has been a very valuable experience which has allowed me to analyze the changing conditions that must be dealt with in an aquaponics system. The high tunnel (similar to a greenhouse) isn’t going to build itself, so I better get back to it!